Holdsworth House in Halifax was built in 1633 but the period 1759-1837 is of particular interest. 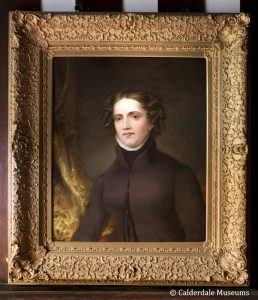 At this time Holdsworth House was owned by the Wadsworth family and from 1817 the daughter, Elizabeth Wadsworth, wrote a diary. It’s these volumes that have revealed links with Anne Lister of Shibden Hall and the Bronte family. Miss Wadsworth was born in Holdsworth House Halifax on 15 November 1760, to Reverend John and Elizabeth Wadsworth. Her mother was the daughter of Samuel Hemmingway of Boldshay Hall – a large estate near Bradford, which was home to several families of influence in the district. Miss Wadsworth had three brothers Henry, John and Samuel; Samuel sadly passed away (of consumption) in 1774 at the house, aged just 18. Rev John Wadsworth died in 1782, aged 62 and so as the eldest son, it was Henry who inherited Holdsworth House. He lived a bachelor existence here alone as Elizabeth, John and their mother went to live at Stott Hill in Bradford. Henry and John both died relatively young and so the Holdsworth House estate passed to Elizabeth, but she spent much of her time between Bradford and Halifax, whilst Holdsworth House was let to a tenant. Elizabeth’s mother died in 1804, leaving Elizabeth alone. She came back to Holdsworth House, aged 45. Being from an influential church family, Elizabeth was very well connected socially although she never married, nor had children. Whilst already quite wealthy, she made a living from letting property, farming and selling off her livestock. She was a great philanthropist and distributed much of her wealth to the poor, the needy, the church and in building of Popples School – the beginnings of Bradshaw Primary. 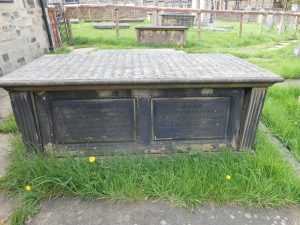 She died at Holdsworth House in 1837, aged 77 and is buried in the family tomb in St. Wilfrid Churchyard, Calverley. In 1817, aged 57, Miss Wadsworth began writing diaries. She continued writing until 1829 and most of her diaries — written in old school notebooks — have survived (retained on deposit by West Yorkshire Archive Services). Anne Lister of Shibden Hall was also a wealthy landowner of similar social standing to Miss Wadsworth. Lister was a more prolific diarist and became posthumously famous because parts of her lengthy diaries were in secret code. The code, once deciphered, revealed a number of Anne Lister’s lesbian love interests, which were considered shocking at the time. Anne Lister has since been the subject of a number of TV dramas, the latest BBC One/HBO costume drama Gentleman Jack airs spring 2019. 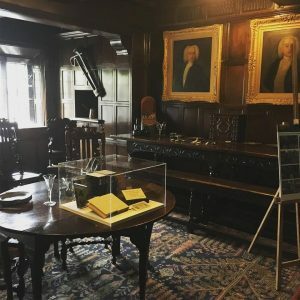 Despite being older than Anne Lister when she began writing a diary, Elizabeth Wadsworth reports on the same early 19th century period in her journals. It is possible to compare entries in both diaries, for the same dates, to get a wonderful insight into the lives of two rather distinctive ladies. Both Wadsworth and Lister were educated at the Manor School in York, albeit a generation apart, so it was probably not uncommon for ladies of such means to keep detailed accounts of their social and financial affairs. There are many similarities in Lister and Wadsworth’s diaries, and proof that they circulated amongst the same notable families (particularly the Priestley family), had the same doctors (Dr Sunderland and Dr Paley) and both worshipped at Halifax Minster (although Wadsworth also frequented Illingworth Chapel). Both were avid readers, gardeners and musicians; Lister played the flute and Wadsworth the harpsichord. There is evidence of them both visiting town events in Halifax too: the Madam Tussaud’s figurines in 1820, and “a very curious exhibition Papyruseum by the late Mrs Aberdeen,” as noted by Miss Wadsworth in 1819. 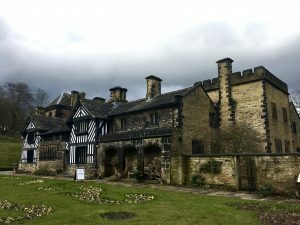 Shibden Hall is now a wonderful museum open to the public and just 3.5 miles from Holdsworth House. Shibden Hall dates from 1420, whilst Holdsworth House was built in 1633. However the Georgian influence of their wealthy occupants is certainly in evidence in both properties. Wood-panelled halls, stone mullion leaded-light windows, low beamed ceilings that retain heat and formal gardens are still being enjoyed today. And that’s not where the similarities end. 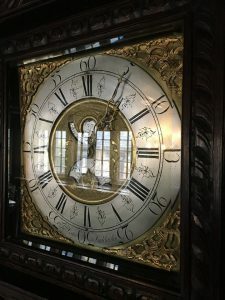 Take a wander around Shibden Hall and you’ll see a grandfather clock that’s strikingly similar to our own, both made by local Lister clockmaker (no connection to Anne Lister). 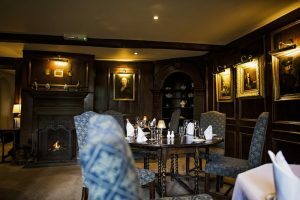 The Panelled dining room at Holdsworth House also bears an uncanny resemblance to the dining room at Shibden Hall. The early 1800s was a time of great army captains like Wellington and Lord Nelson (and of course a Duke of Wellington’s Regiment was based in Halifax). Elizabeth Wadsworth makes references to these great names in her daily observations of the news. Other names interwoven in Miss Wadsworth’s life include Dorothy Wordsworth who lived in Halifax (the sister of poet William Wordsworth) with whom she drank tea on occasions. Through her links with the churches in Bradford and Haworth, Miss Wadsworth was acquainted with Patrick Bronte and his wife Maria, parents of Charlotte, Emily, Anne and Bramwell. 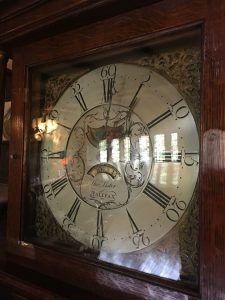 There’s so much rich history to discover in Halifax and a break at Holdsworth House lets you fully immerse yourself in the era of Anne Lister and Elizabeth Wadsworth. You’ll enjoy a most comfortable overnight stay and award-winning bar and restaurant too. 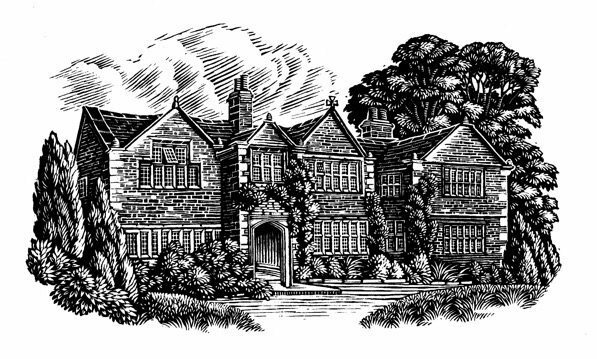 Our Anne Lister Discovery Break provides an overnight stay with dinner and entry for two adults to Shibden Hall. We highly recommend a trip to Shibden Hall in Halifax and the Bronte Parsonage Museum in Haworth. Whilst you’re here, visit The Piece Hall (mentioned in both the Lister and Wadsworth diaries), Bankfield Museum and the Duke of Wellington’s Regiment Museum too.